The Original “Snake Oil” Was Effective At Treating? The Largest Stadium In The World Is Located In? 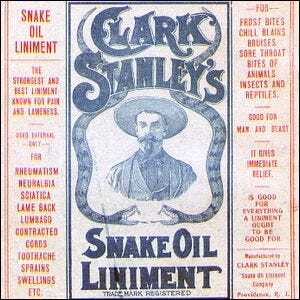 Today, the term “snake oil” is a code for fraud. Politicians accuse other politicians of selling “snake oil promises”, a fraudulent businessman is referred to as a snake oil salesman, and since the early 20th century, the term has been completely and utterly entangled in the idea of fake cures and shady business practices. But why? Why not “horse meat salesman” or any other term? The history of the term is fascinating if, for no other reason, than once upon a time snake oil was actually an effective treatment. In the 19th century, Chinese workers flooded into the American West to help build the massive railway network that supported the influx of workers, commerce, and the development of the frontier lands. They brought bottles of snake oil with them, specifically, oil rendered from the fat of the Chinese water snake. This literal snake oil was rich in omega-3 acids and the Chinese workers would rub it on their joints to help stave off the pain of arthritis, bursitis, and muscle inflammation. When American workers tried it for the same ailments, they were amazed that the oil did, in fact, penetrate into their aching muscles and joints to bring relief from the pain. It wasn’t long, naturally, before American businessmen tried to cash in on the treatment and create their own snake oil. Alas, rattlesnakes and other snakes abundant in the West weren’t as rich in omega-3 acids as the Chinese water snake is and the resulting American-produced snake oils weren’t particularly effective. Not only that, but the Americans selling the snake oil quickly began making outlandish claims about it. While the original and radically more effective Chinese water snake oil was good at reducing inflammation, the American snake oil salesmen claimed their oils could cure headaches, help with menstrual cramps, fix up ailing kidneys, and every other ailment under the sun including, but not limited to, frostbite and balding. By the time the early 20th century rolled around, the Pure Food and Drug Act of 1906 gave the government legislative clout to put an end to such fraudulent medicines. At that point, however, the term “snake oil” was forever linked with the matter and waves of Western films in the early to mid-20th century further cemented the idea of snake oil and the nefarious snake oil salesman into the America psyche. Image courtesy of the National Institutes of Health/Wikimedia.